Cannot connect to the application installation source. #917 Cannot connect to the application installation source. Installing KPM complete with error Cannot connect to the application installation source. I am sorry, but it is your internet provider blocked download KPM build. 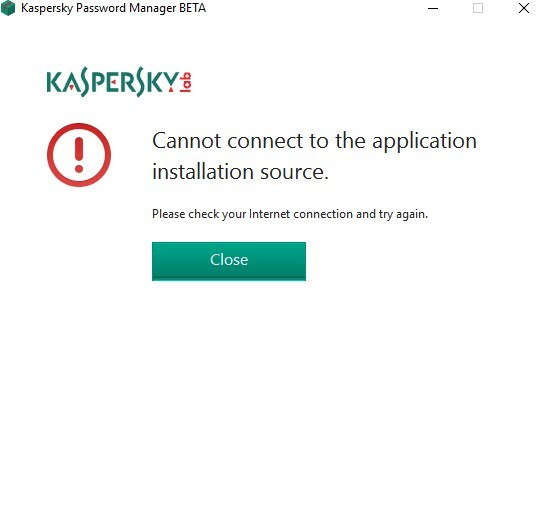 I can recommend use Kaspersky Secure Connection, but it is all that i can do for you. Victor, you please download archive Traces connection witch VPN connection was though Kaspersky Secure Connection. Try to open https://demo.ucp.kaspersky-labs.com/distr//mlg-INT/kpmwin/9.0.2.696/ in Internet Explorer using connection was though Kaspersky Secure Connection. If it is not available, something in your PC still block "Kaspersky laboratory" resources. With KSDE https://demo.ucp.kaspersky-labs.com/distr//mlg-INT/kpmwin/9.0.2.696/ open in web brower but install KPM does not install.